Designed to provide excellent traction and handling, this newly formulated tread stock also carries long-wearing properties for excellent value. This new performance radial meets H-rated speed criteria of 130 mph on indoor wheel tests. 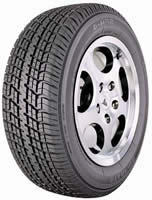 With a deep tread depth and high void ratio, this all-season design provides excellent traction in all types of weather conditions throughout the year. The wide tread arc increases the tire's road contact area for improved traction, handling and treadwear characteristics.